For those of you who know my mom, you know that she is not the least bit lazy. Actually, I might go as far to say that she feels slightly insulted that she must share the name with the turning platter or spice cabinet. Not exactly knowing the origin of how the common kitchen apparatus came to be, I almost want to deem it a new non-lethargic name: Non-Lazy Susan. After all, that turny thing really does a lot of work when you think about it. Why the rambling about a kitchen item? I’ll explain. Last week was my spring break. No, I don’t have any crazy Mexican Riviera stories to share, nor did I wake up sunburnt in especially uncomfortable places. But Rob and I do have some pretty amazing stories, and recipes, to share from last week’s Orange County adventures. It all started with a lovely trip to the mall (one of many trips to the mall) where we learned that one of California’s most known names in the culinary world of Italian, California, and specifically Wine Country cuisine would be visiting for a book signing. It was a small event, and Rob and I were lucky enough to be at the right place at the right time to RSVP. So Thursday night, Rob, my mom, and I sipped a bright up-and-coming red wine blend (Bridesmaid), and ate a lovely pasta salad appetizer and waited among other food and wine enthusiasts to meet Chef Michael Chiarello. Needless to say, his stories about food and cooking inspiration, and the trials, tribulations, and joys of wedding celebrations were heartfelt and genuine and probably made everyone want to go home and whip up a remarkable dish to share. I, too, was getting motivated and started thinking about what I could create with the bounty of spring veg popping up these days. But it wasn’t until I publicly implied that my mother lazy in the middle of his presentation that made me want to go home and crawl under a rock. While showing and explaining some of his retail products, mid-sentence Chef Chiarello paused for a moment and started asking for a “Susan.” Thinking he was being funny and looking for someone to use in his story, I turn and point to my mom with a small “she’s right there!” outburst. “A Lazy Susan?” Chef asked, turning in the direction of my pointing finger, aimed at my mom who had just happened to be sitting down near the side of the room. An audible gasp and even more audible giggle engulfed the room as my face turned to a deep shade of strawberry – seriously, visions of a “Violet” casting for the next Willy Wonka remake ran through my head. Quickly I tried to diffuse the situation. “No! No!! That’s not – oh crap,” which, of course, evoked more unwanted crowd reaction. My mom was smirking and shaking her head. Rob had an I-want-to-laugh-at-you-but-know-that-will-most-likely-get-me-in-trouble-face. “Is that Susan?” Chef asked. “Well, she doesn’t look lazy,” he continued, “but she is sitting down.” More less-tense crowd laughter ensued, leading to an expertly diffused situation on his part. And as he continued with his initial thought of explaining the usefulness of the turning platter, I turned to go give my mother a hug and apologize. She was smiling, which made me thankful to see that the experience had been a funny one, and a completely memorable faux pas (but just to be sure, when we got our cookbooks signed, I did introduce my mom as Non-Lazy Susan). While that little moment was, well, memorable to say the least, the rest of the night and the rest of our vacation was wonderful. We spent some amazing time with my mom, I got to go to Heather’s baby shower, and we shared some amazing meals. I have commented enough that the fish from the Oregon Coast is outstanding – and it is – but, there are some down south that Oregon just can’t beat. 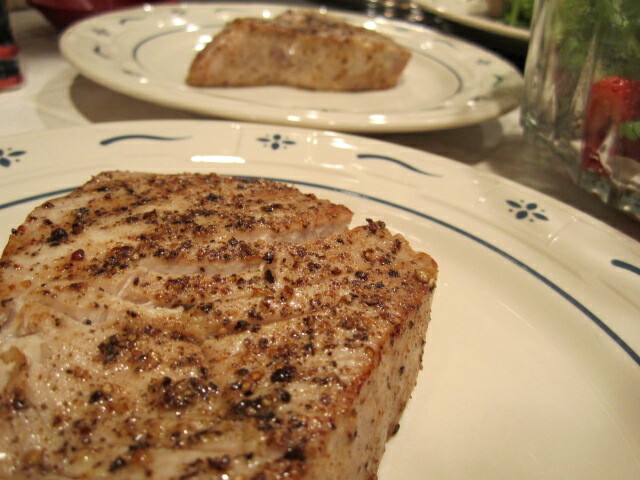 Case in point: Ahi Tuna. It’s a more warm-water fish (tropical and subtropical), one that could not survive the cold, often arctic streams of water we have up here. So, as best to do on vacations, we indulged: Brown Butter Seared Ahi Steaks with Strawberry and Arugula Salad. Yum. It was a very “California” dish as strawberry season recently started and a few miles from my parent’s house is one of the best organic strawberry farms in the area. To this day, I’ve never found a strawberry to beat theirs (and I eat a LOT of strawberries during the months of March through June. I’m surprised I don’t turn into a strawberry. Oh goodness… channeling Willy Wonka again). We also visited the UCI Farmer’s Market, brining home beautiful veg and sausages, which ended up in a Wild Mushroom and Thyme Frittata, and an oh-so-comforting meal starring my mom’s Sweet and Sour Cabbage that is just to die for. Traveling home late Sunday night, I knew going back to work was only a few hours away, and our blissfulness of vacation was waning. But, with our food and our experiences, we have the memories to keep and stories to share. If you are in a location to get local sushi grade Ahi, please try out this recipe before strawberry season ends – the combination of the creamy rare fish with the tangy sweet strawberries and peppery greens may even make you feel indulged and relaxed by a mini vacation (just don’t go accidentally call your mother Lazy!). 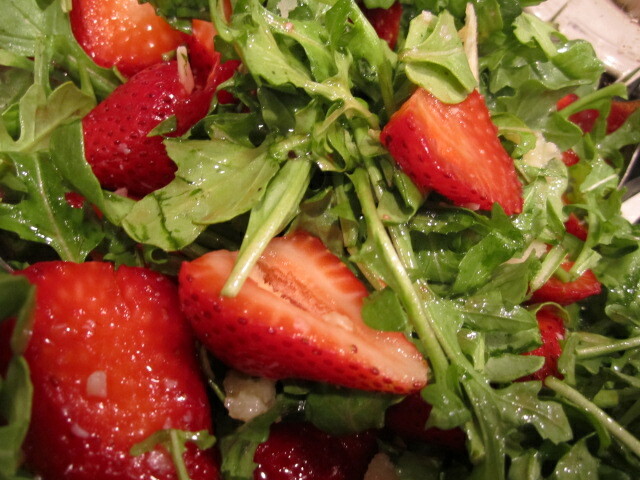 For the salad, mix the arugula, basil, and strawberries in a large bowl. 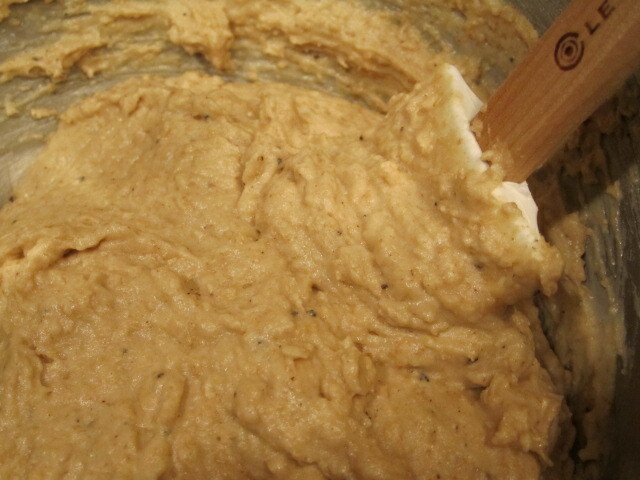 To make the dressing, mix the vinegar and lemon juice in a bowl, and add a bit of s&p. 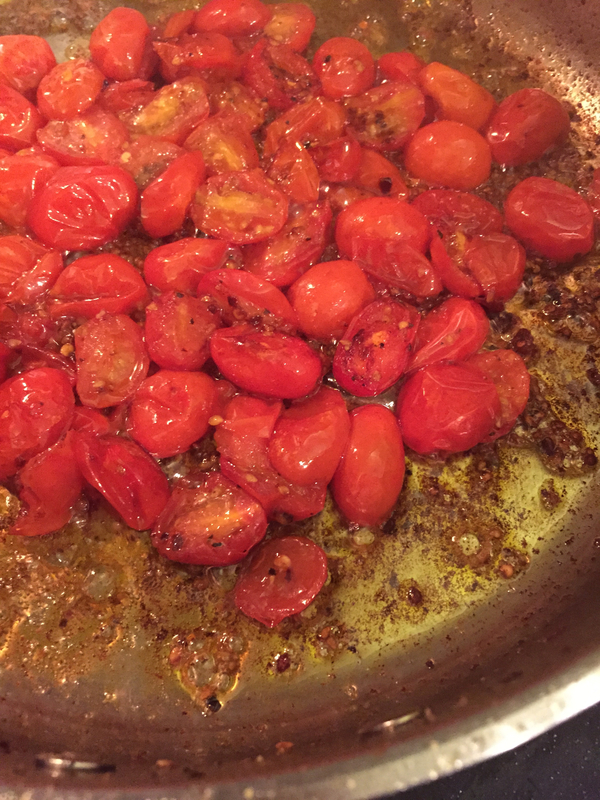 Whisk in the extra virgin olive oil until emulsified (you will toss the salad with the dressing right before serving; the dressing should just be a touch of tang to the salad, not overly dressed at all). Taste for seasoning. 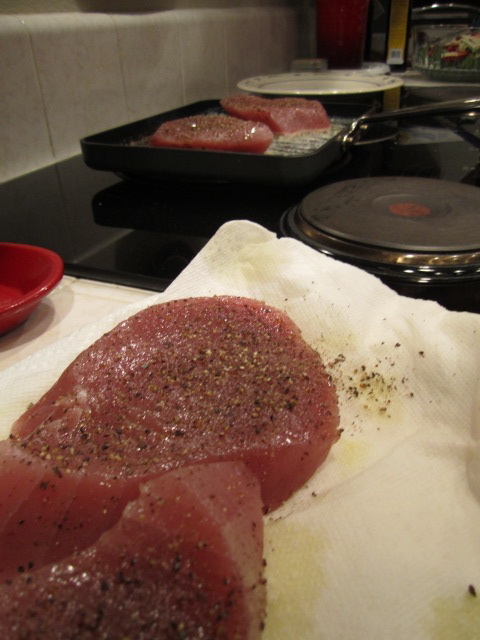 To prep the Ahi, pat the steaks dry with a paper towel, and season with a drizzle of olive oil, salt, and a very generous bit of pepper. Preheat a heavy bottomed pan to be smokin’ hot. Melt the butter in the pan until brown bits start to form. Then using tongs, add the Ahi to the pan and sear each side, about 2-3 minutes, depending on the thickness of the steak (the inside should stay very rare). Serve the steak with a handful topping of the salad, and shave a few shreds of parmesan regiano on top. Maybe drizzle a bit of fruity finishing oil on top, if you have it. 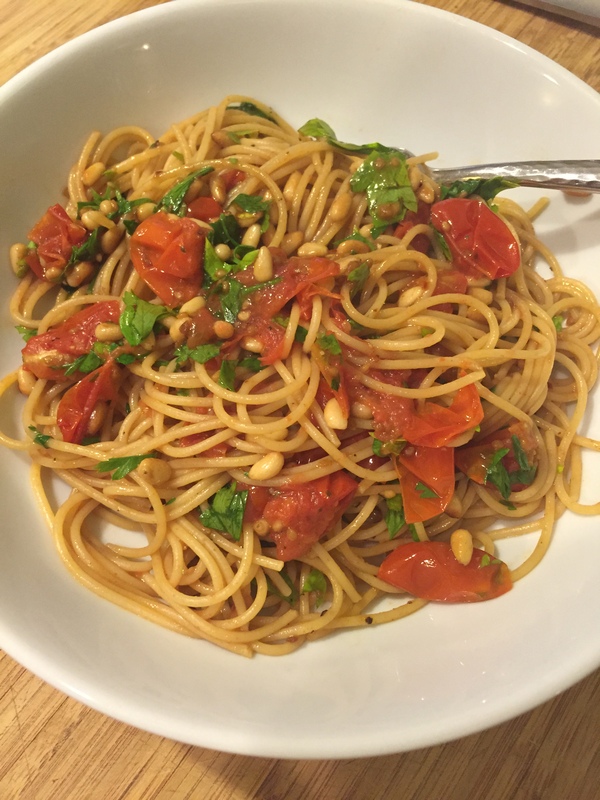 This pairs beautifully with a light California Pinot or Sauvignon Blanc. Enjoy! !